JMC Pressure Roller Units are mainly developed for use in the continuous furnace of Sintering and Palletising plants. These ready to mount units are also suitable for all application where heavy loads are to be accommodated and the direction of rotation is frequently reversed. 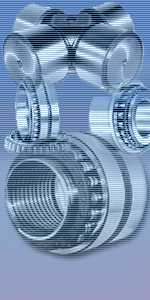 JMC Pressure Roller Units are basically double row full complement Cylindrical Roller Bearing. The very thick walled outer ring has three integral flanges. The highly wear - resistant outside diameter surface is cylindrical, being relieved towards the form of a chamfer. The Inner ring is in two halves, each of which has an integral flange, which is designed to enable the units to carry heavy axial loads in addition to radials. Oil seals inserted between the Inner ring flanges and Outer ring groove prevent contamination from entering the bearing and lubricating grease from leaving out and make the bearing as one solid integral unit. The Units are designed for maintenance free operation and should therefore not to be washed before mounting. 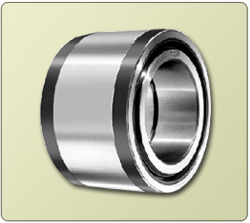 In Contrast to normal rolling bearing where the outer ring is supported over its whole circumference by the housing bore, load is applied to the Pressure Roller units Via a small contact area on the outer ring Cylindrical surface. Deformation of the Outer ring values for the maximum permissible radial, dynamic and the static bearing loads are given in the table. The permissible Static load which can be applied to a Pressure roller unit is obtained from the smaller of the two values for C and Co.